The exhibition at Vipaji Gallery in Dar es Salaam, titled Domo-Cartoon and curated by Gadi Ramathan featured works by illustrators and the pieces highlight certain causes. An illustration by Said Michael depicts a foreign mining agent, hacking away at the bottom of a cliff and filling bags with precious minerals. Meanwhile, on top of the now perilously undercut cliff, are villagers in their humble dwellings. 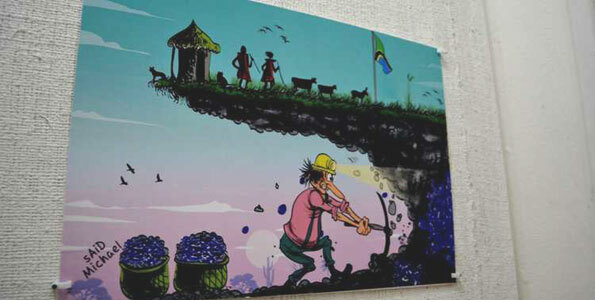 His work represents the sentiments of those living near mines, who are accusing mining companies of displacing them from their ancestral homes, and work is part of a campaign against land grabbing in the country. Another exhibition with a social message is titled Sentinel at the Black Tomato Restaurant in Dar es Salaam. It was curated by fine artist Nadir Tharani, who is also an award winning architect. The exhibition had works of acrylic on canvas, showcasing nostalgic silhouettes of fast disappearing trees native to the Tanzanian coast such as the mnazi, the common tropical palm tree (cocos nucifera). The World Wildlife Foundation has documented the biodiversity found in the East African coastal forests and the human and natural pressures that threaten their existence. The exhibition features mkunga (cacia nilotica), mvule (Milicia excels), mkwaju (Tamarindus Indicus), mbuyu (the baobab tree or Adansonia digitata) and the mkuyu-mkungu tree (Ficus sycamorus).